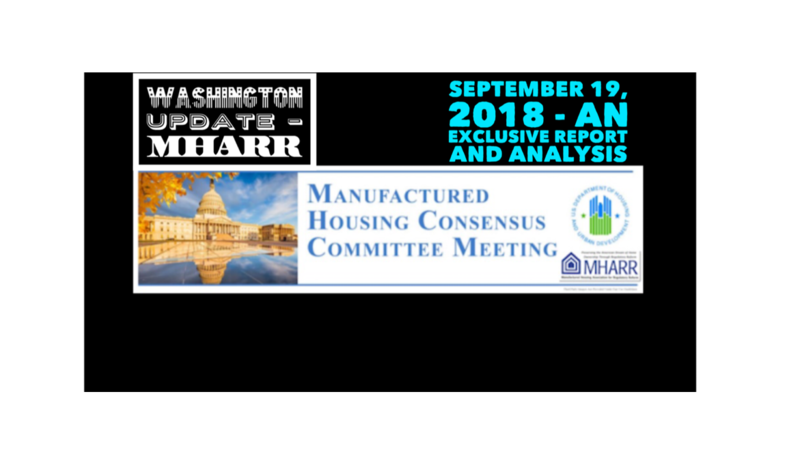 The statutory Manufactured Housing Consensus Committee (MHCC), meeting in Washington, D.C. from September 11-13, 2018, tackled a lengthy agenda of proposed items, including proposals derived from deregulatory comments filed by MHARR (and other stakeholders) pursuant to Trump Administration Executive Orders (EO) 13771 and 13777, concerning a wide range of matters, including the Subpart I regulatory process, multi-unit manufactured homes, so-called “add-ons,” on-site construction and HUD’s proposed “frost-free foundation” Interpretive Bulletin (IB) (allof which were raised and addressed in detailby MHARR in its February 20, 2018 manufactured housing program deregulation comments pursuant to EOs 13771 and 13777), as well as separate comments regarding the U.S. Department of Energy (DOE) Notice of Data Availability (NODA) on proposed manufactured housing energy standards (seealso, article below). HUD’s ultimate disposition of these (and other anticipated) deregulatory recommendations by the MHCC (and other program stakeholders), will be a key test of the implementation of the Trump Administration’s deregulatory policies at HUD, including the strength and persistence of Trump Administration appointees at the agency, as contrasted with the entrenched regulatory bureaucracy at HUD and other federal agencies including, but not limited to, DOE. Subpart I Procedures: The MHCC approved a motion to reduce the frequency of in-plant record reviews in 24 C.F.R. 416(a)(4) from “at least” once per month to once per quarter (MHCC Log Item 153). Industry members will recall that when Subpart I was amended in 2013, as a consequence of a Petition for Rulemaking filed by MHARR seeking wide-ranging reforms to the overly and unnecessarily-costly Subpart I process, HUD – in the final rule (e., afterthe rulemaking comment period had expired) – surreptitiously inserted language in the rule requiring “at least” monthly IPIA record inspections. MHARR, at the time, and ever since, has strenuously objected to the needless and unduly burdensome “monthly” record inspection mandate — including calls to eliminate that baseless mandate in its June 7, 2017 EO 13771/13777 comments to HUD and its February 20, 2018 comments regarding the specific application of EO 13771/13777 to the HUD manufactured housing program. While mandatory quarterly inspections will still unnecessarily constrain IPIA discretion to conduct fewer inspections for manufacturers with proven compliance records, the change would nevertheless help to reduce regulatory compliance costs from current excessive levels and represents a step in the right direction. Energy Regulation: The MHCC took several important steps on energy regulation. First, by a vote of 17-1, following extensive comments by MHARR’s representative at the meeting, the Committee rejected a motion by a former MHCC member and energy special interest participant in the DOE Manufactured Housing Working Group (MHWG) that would have put the MHCC on a path to actively consider DOE’s high-cost June 2016 manufactured housing energy standards proposed rule, even though that proposal has effectively been superseded by the August 3, 2018 DOE NODA. Put differently, that proposal (MHCC Log Item 170), would have done an end-run around DOE’s retreat from the fundamentally tainted and arguably scandalous June 2016 DOE proposed rule, and would have retrenched that proposal, effectively, as a potential HUD standard. In addition, the MHCC (with significant input from MHARR’s representative at the meeting), only days before the September 17, 2018 DOE NODA comment deadline, adopted resolutions strongly expressing its continuing disapproval of DOE’s extremely costly and market-disruptive energy proposals for HUD Code manufactured housing (see, article below for the text of the MHCC’s resolution), and calling, as well: (1) for continuing HUD engagement with the MHCC on this matter; (2) for HUD’s Policy Development and Research (PD&R) office to develop information and data on potential energy regulation cost impacts on manufactured housing within sixty days; and (3) for DOE (and, effectively, Congress) to re-delegate the entire matterof manufactured home energy performance back to HUD. MHARR, as the onlynational industry organization to continuallyoppose this rulemaking from its inception and at every stage, will continue to make this matter a top Association priority going forward. “Frost-Free” Interpretive Bulletin and “Field Guidance”:The MHCC also took action on MHARR’s call in its EO 13771 and 13777 deregulation comments (see, February 20, 2018 MHARR comments at pp. 28-30) for the withdrawal of HUD’s proposed “Frost-Free Foundation” Interpretative Bulletin, which would unilaterally and unlawfully change the existing federal manufactured housing installation standards be equating “acceptable engineering practice” — currently permitted by section 3285.312 of the standards — with the requirements of the American Society of Civil Engineers 32-01 reference standard in every instance. By a unanimous vote, the MHCC recommended that HUD withdrawthe existing proposed IB – the development and publication of which MHARR had strenuously opposed in written comments filed with HUD in 2017 and in direct meetings with HUD Secretary Ben Carson and senior-appointed HUD officials – and that further action on an amended, legitimate IB be referred to the MHCC’s Regulatory Subcommittee. Going forward, in addition to necessary changes to any IB, MHARR will also seek a parallel MHCC resolution for the withdrawal of HUD’s Frost-Free Foundation “Field Guidance” memorandum, which preceded the proposed IB and has not been rescinded. This Frost-Free “Field Guidance” memorandum was addressed in MHARR’s February 20, 2018 EO 13771/13777 comments, which called for the withdrawal and/or invalidation of multiple “Field Guidance” edicts that were issued by HUD without MHCC review and recommendations as required by the Manufactured Housing Improvement Act of 2000. Carports, Garages and “Add-Ons”: The MHCC, in addition, addressed multiple proposals dealing with standards changes and/or the withdrawal of HUD “Field Guidance” memoranda (which were never submitted to or addressed by the MHCC, in violation of the Manufactured Housing Improvement Act of 2000) concerning carport-ready homes and attached garages. In part, the Committee voted to recommend the withdrawal of HUD Field Guidance memoranda requiring Alternate Construction (AC) approval for carports, by effectively classifying carport-ready designs as involving an “add-on.” The Committee also adopted a resolution supporting amendments to various sections of the Procedural and Enforcement Regulations to permit specific “add-on” structures, including garages. Again, eachof these changes have been specifically addressed and advocated by MHARR in both written comments and direct interactions with HUD officials. Multi-Family Manufactured Homes: Lastly, in response to a specific proposal (MHCC Log Item 160) addressing, among other things, the definition of the terms “dwelling” and “dwelling unit” within the Part 3280 Manufactured Housing Construction and Safety Standards, HUD confirmed that a previous MHCC proposal to permit “multi-unit” manufactured homes – crafted and approved by the MHCC with the strong support and significant substantive input of MHARR – will be included in upcoming standards revisions currently being developed by HUD. While, as is demonstrated above, the MHCC made important progress in a number of key areas, and particularly with respect to deregulatory proposals submitted in response to HUD’s manufactured housing program-specific EO 13771/13777 regulatory review, significant portions and aspects of the nearly 250-pages of proposals forwarded to the MHCC by HUD (essentially passing-through deregulatory comments submitted by 157 organizations and individuals) remain to be considered and addressed. MHARR, therefore, will continue to aggressively seek proper HUD engagement with the MHCC, timely MHCC consideration of deregulatory proposals and participation in the program EO 13771/13777 process, and both timely and proper follow-up by HUD in accordance with both EO 13771/13777 and allapplicable provisions of the 2000 reform law. MHARR has filed comments strongly opposing alternative new energy proposals put forward by the U.S. Department of Energy (DOE) in its long-running and irretrievably-tainted manufactured housing energy standards rulemaking. 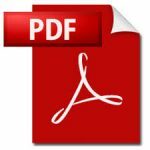 In written comments filed on September 17, 2018, MHARR, in response to an August 3, 2018 DOE Notice of Data Availability and Request for Information (NODA) regarding a series of “alternative” DOE proposals for manufactured housing energy criteria, objected to the adoption of anyproposed manufactured housing energy standards based on – or derived from data developed during – the fundamentally tainted, illegitimate and fatally-flawed “negotiated rulemaking” process conducted by DOE in 2015 and 2016. That process, as demonstrated by documents obtained by MHARR pursuant to the Freedom of Information Act (FOIA), was structured by DOE and special interest allies as widow-dressing after DOE, by its own admission, “impermissibly” distributed copies of a draft energy rule to many of the same special interest groups. Noting that manufactured homes, built in accordance with existing HUD standards, alreadyachieve whole-house energy operating costs that are less than – or, in the case of electricity — only slightly higher than those for other types of homes, at a significantly lowerpurchase price that is inherently affordable without the need for costly government subsidies, MHARR stressed that the “alternate” DOE proposals (as well as the June 2016 DOE proposed standards) would either: (1) exclude hundreds-of-thousands (and potentially millions) of households from the manufactured housing market and homeownership altogether, with no possible offsetting benefits; or (2) offer minimal benefits to those not altogether excluded from the market at a significant additional initial cost of as much as $5,000.00 for a double-section home in Climate Zone 3 that would harm home purchasers and negatively impact competition within the manufactured housing market to the extreme detriment of smaller, independent manufactured housing producers. MHARR believes, and has advised DOE, that it essentially has three possible courses in this matter, either – (1) abandon any manufactured housing energy rulemaking; (2) re-start its manufactured housing energy rulemaking process from the beginning, to eliminate any ongoing taint or prejudice from the improper and illegitimate “negotiated rulemaking” process; or (3) face potential litigation if it fails to act in accordance with either of the foregoing courses of action. As it has been from the outset, possible DOE energy regulation, and aggressive, consistent opposition thereto, is – and will remain – a top regulatory priority for MHARR. The “MHARR Washington Update” is available for re-publication in full or in part (without alteration or substantive modification), without further permission from – and with proper attribution to – MHARR.